The aim of the OSP is to help students gain the emotional intelligence, mindset, work ethic and creative thinking skills to cope with the demands of elite universities, not only in the UK but also around the world. We do this by leveraging technology and connecting the very best UK tutors with our best local students. Innovative, progressive and ambitious. That’s why we’re Nigeria First and Leading Sixth Form College. Oxbridge Tutorial College caters for the more academically able students – who so often remain unchallenged at other schools – through its collaboration with UK-based educational consultancy Insight Education. The Oxbridge Scholars Programme (OSP) is a selective course run by Insight Education throughout Years 12 and 13. Students who meet the selection criteria of six A grades at IGCSE will be invited by OTC to join the programme. The aim of the OSP is to help students gain the emotional intelligence, mindset, work ethic and creative thinking skills to cope with the demands of elite universities, not only in the UK but also around the world. The OSP is not only designed to help stretch Scholars beyond what they think possible, it also develops leadership skills in Year 13 students who are responsible for facilitating preparation for monthly OSP sessions and mentoring Year 12 Scholars on completing their university application forms. Leadership, mentoring and knowledge transfer are intended responsibilities for all of OTC’s Scholars, alongside academic achievement. Note: the OSP runs alongside A level studies and is designed to prepare students for the demands of studying at elite universities. All OSP Scholars are expected to keep up with A level and OSP homework. The creative thinking skills exercised at these OSP sessions will academically stretch students to achieving the highest grades and are useful preparation for competitive undergraduate courses in medicine, law, humanities and sciences at UK Russell Group and American Ivy League universities. 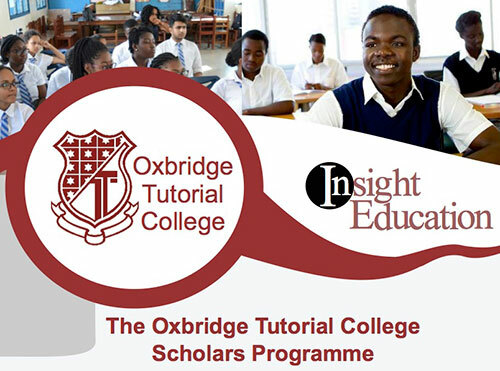 The performance of OTC’s scholars will be monitored throughout and, by the December of Year 12, some scholars may be invited to join Insight Education’s Oxbridge Mentoring Scheme or Ivy League Mentoring Programme, where they will receive tailored one-to-one support in January of the New Year. A place on either programme automatically entitles scholars to group-based OSP sessions, run after school throughout sixth form.